Mick Tarrant, who ran the Armadillo Records shop on Queens Road, Westbourne, in the late-1970s, met McLaren early in his career. (Nov 8, 2012) John Z said:Absolutely brilliant shop. Lived in Bury on a visit to Bournemouth this shop was on the same street as our hotel and made a 2 week holiday in the late 70’s great. Wish I’d bought even more from them! 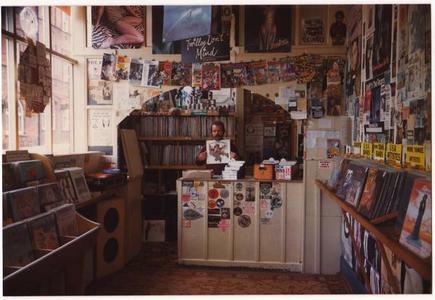 Possibly my favourite ever record shop! (Mar 22, 2012) Anonymous said:Great shop, loved it !! Name Ray Symbolic Comment Far and away the greatest (non-reggae) record shop in the world – and that's not just nostalgia talking. Mick was often challenging in person; I lost count of the number of times he 'barred' me for the heinous crime of looking through a box of singles twice, or sniggering at his West Coast affectations and walrus moustache. What I didn't realise until much later was that Mick would drive down to Rough Trade every Friday, to select stock which simply wouldn't have been otherwise available in Dorset. Much like Peel, I think, he was happy to promote underacknowledged music, whether or not it met with his tastes, and worked tirelessly to keep apace with rapidly accelerating developments in post-Punk etc. He also brought the Mighty Observer to Bournemouth's Town Hall on more than one occasion, DJ'd between bands at the Midnight Express, and worked on many local co-promotions with the Comix bookshop and rehearsal studios next door. Whilst Armadillo was very much Mick's idiosyncratic personal fiefdom, it acted as a social hub for misfits and fanatics of varying stripe, many of whom will owe their musical eduction to his ceaseless efforts. ( Oct 14th, 2016).